In a deep fryer, add vegetable oil so the oil is about 3 inches deep; heat oil to 375 degrees. In a large mixing bowl, take 1 and 1/2 cups of the flour and add the sugar, salt, cinnamon and nutmeg. In a separate bowl, lightly beat the eggs. Add milk and stir. Add wet ingredients to dry ingredients. Add shortening. Mix with an electric beater set to low speed for about 30 seconds - making sure to occasionally scrape batter down that sticks to the side of the bowl. Increase beater speed to medium and beat for an additional 2 minutes - adding a bit of remaining flour every 10 or 15 seconds until all flour is used. Turn dough out onto a well-flour surface. Sprinkle a little flour over the top of the dough. Roll out dough until it’s about a 1/2 inch thick. Cut out individual donuts with a donut cutter. Dust the cutter with a little flour to avoid sticking. Carefully, drop donuts into hot oil: wear a cooking glove or oven mitt and transfer donuts to oil using a spatula. As the donuts cook, they will rise to the surface of the oil. When they do, flip them with the spatula. Fry them for about 1 minute per side - until golden brown. 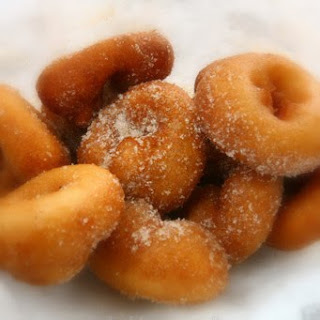 Transfer completed donuts to stacked paper towels to drain off excess oil & allow donuts to cool to room temperature then dust with powdered sugar and serve.